Today I am sharing a recipe that has been on my bucket list for years: homemade croissants! 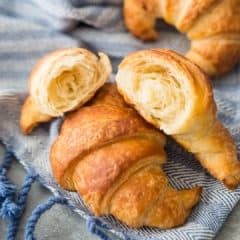 I’ve wanted to try making them forever, and there are TONS of croissant recipes out there to choose from. But after creating this easy puff pastry recipe, I had a feeling that I could create a version that’s quicker, simpler, and far less intimidating than anything else. So I’ve taken my time and done just that. And I think you are going to love how much easier this is! If you have never had a croissant before, boy are you in for a treat! Croissants are a classic French pastry, rolled and shaped into a crescent. They’re light and airy, and so buttery, with a hint of sweetness and a little bit of a yeasty, stretchy texture. There’s nothing else quite like a croissant! And when you make them yourself, from wholesome ingredients like real butter and milk, they are completely out of this world. You won’t believe how delicious croissants can be when you’ve taken the time to make them with your own two hands! 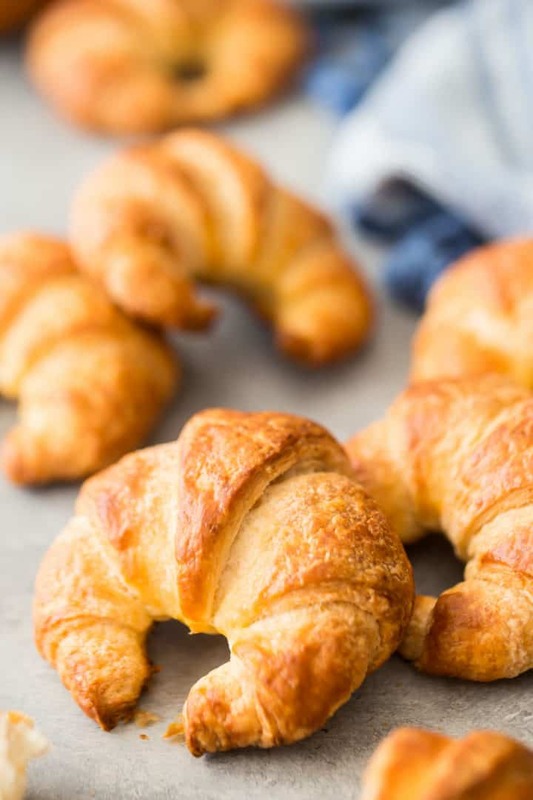 Croissants fall into that category of “laminated pastry.” This means the dough gets folded over and over again, with cold butter in between each tissue-thin layer. When they’re baked in the oven, the cold butter creates steam, and the layers puff up like crazy. The end result is incredibly light and flaky, and so delicious. To learn more about laminated pastry doughs, check out this puff pastry recipe, these homemade crescent rolls, this flaky pie crust, or this Danish dough. ARE CROISSANTS MADE WITH PUFF PASTRY? While the texture of a croissant is very similar to that of puff pastry, there are some key differences. Namely, puff pastry does not contain any sugar at all. It’s definitely a little more savory than sweet. And, croissants contain yeast, where puff pastry does not. Croissants are also made with milk; puff pastry just has water. ARE CROISSANTS MADE WITH DANISH DOUGH? Croissants are definitely more similar to Danish than they are to puff pastry. There is only one difference, and that is the addition of egg. Danish dough contains egg but croissants do not. IS IT HARD TO MAKE HOMEMADE CROISSANTS? I would definitely characterize a classic French croissant recipe to be more for an experienced baker. There are a lot of steps, a lot of folding, and a lot of specific measuring and counting. But for this recipe I’ve cut out a lot of that! And to me the result is every bit as good. You still get the incredible rich, buttery taste, and all those flaky layers. They are absolutely heavenly when fresh out of the oven! Store bought could never even hold a candle next to this recipe. The most important thing to remember is to keep the dough cold at all times. Work as quickly as you can, and if at any point you notice the butter becoming soft, wrap it right up and chill it until it’s stiff again. Cold butter is the absolute key to success when it comes to laminated doughs! My goal here was to eliminate that extra step of creating a butter square and encasing it in the dough. It’s very effective for getting butter in each and every layer, but at the same time it can be time consuming. Plus it’s a little intimidating, with all the exact measuring, etc. So for this recipe, we are just slicing the cold butter into thin slivers and mixing it right in to the dough. After it’s been chilled and folded, you’ll still have all those beautifully flaky layers, but it really cuts down on the prep! Chill this dough for 1 hour, and then you can start rolling and folding! You can see how this process looks when you watch the video in the recipe card at the bottom of this post. HOW MANY TIMES SHOULD CROISSANT DOUGH BE FOLDED? Many recipes are super specific about how many times croissant dough should be folded, but I find that to be overly fussy. It stresses me out when I read a recipe like that! So much so, that it often will intimidate me right out of trying. I think it’s totally ok to let this process be a little more intuitive. If you understand what a croissant is meant to be, then you know there are countless of flaky layers of pastry. So just know that the more you fold it, the more layers there will be. Now it’s good to have lots and lots of layers, but at a certain point the layers can become so thin they’re kinda non-existent. So as you’re rolling along, notice the feel of the pastry- has the butter flattened out into many thin sheets within the dough? Or is it lumpy and bumpy? You’re shooting for lots of thin, even layers. You should be able to see large streaks of butter running throughout, but the dough should lie flat and smooth, and not have a lot of rough bumps. For me this is usually achieved after around 4 to 6 folds, depending on how thinly the butter was sliced at the beginning. Divide the dough in half so it’s a little easier to work with, then roll it out to a big, long rectangle. It’s not necessary to get too hung up on measurements, but ideally you’re looking for a little more than 10-inches wide, 22-inches long, and about 1/8-inch thick. With a sharp knife or pizza cutter, trim the edges away and cut the dough into long, skinny triangles. Aim for a width of about 5 inches. Next, cut a little notch in the wide end- this will help the croissant to bend more easily and keep it’s curved shape. 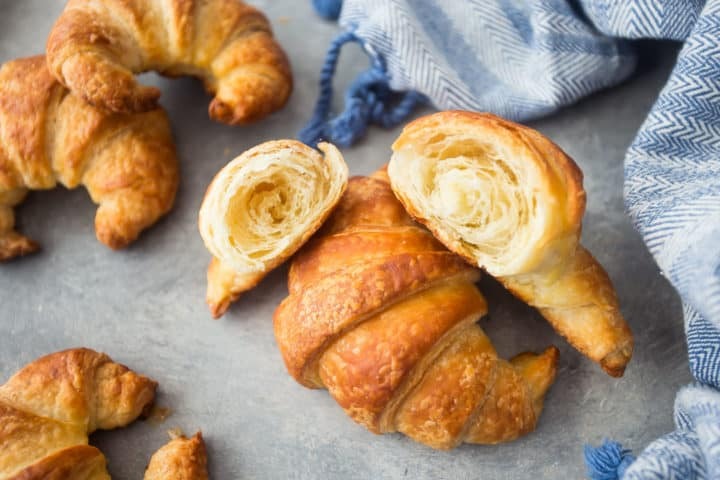 Croissants are perfect just as they are, but if you’d like to dress them up a little bit, they can be spread with all sorts of yummy toppings. Anything from a smudge of soft butter, to a bit of jam, lemon curd, or apple butter would be a fantastic addition. Or you can stuff them before baking! Lay a few pinches of chopped dark chocolate across the wide edge of the triangle, before rolling. Or layer with ham and cheese. So yummy! You can also split these croissants horizontally, and treat them like a sandwich bread. I love a little chicken salad sandwich on a croissant! Keep these homemade croissants in an airtight container, and they should last for several days up to a week. In the refrigerator, their shelf life will extend to about 10 days to 2 weeks. 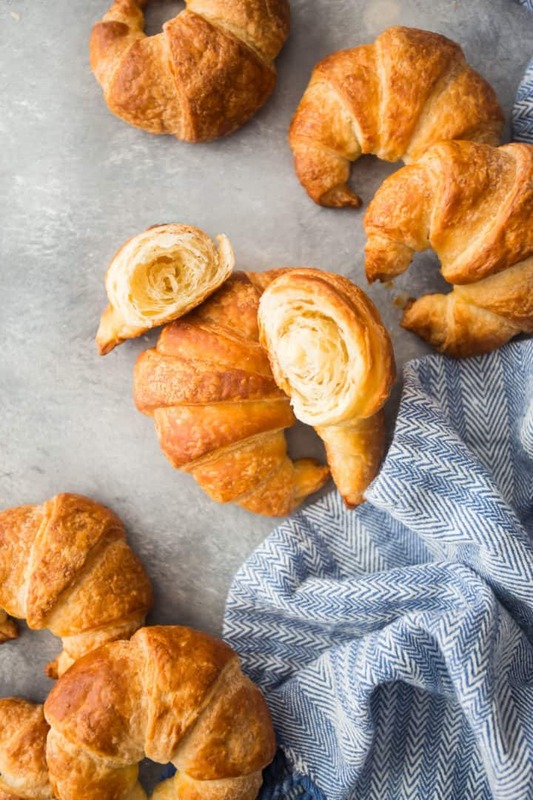 Croissants can most definitely be frozen after they are baked. Like many other kinds of bread or pastry, they freeze beautifully and thaw in just about an hour or less at room temperature. However, I would not recommend freezing unbaked croissants or croissant dough. Although many bread doughs can be frozen after their first rise, there is a chance that the yeast will not survive. 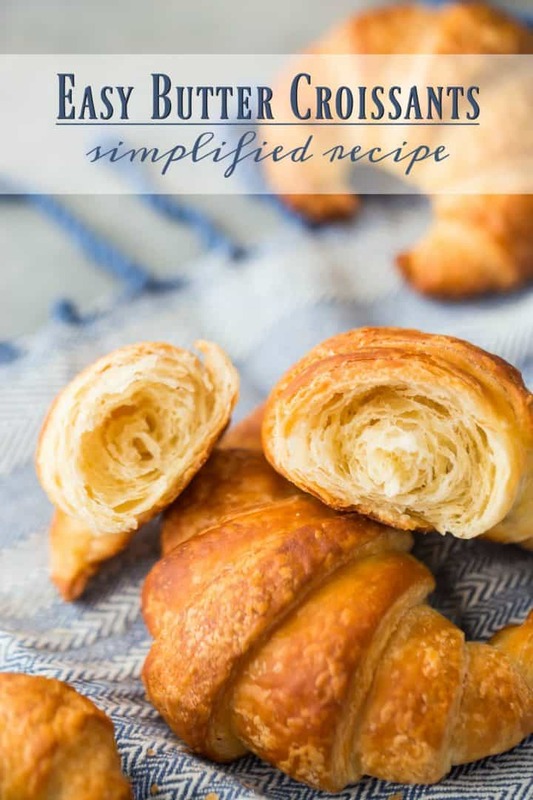 I hope this simple recipe has encouraged you to give homemade croissants a try! I really think it’s so much easier and less intimidating. And the results are absolutely stellar! Let me know what you think! Place the flour, sugar, yeast, and salt in a large bowl and whisk together until combined. Slice the butter into 1/8-inch thick slices and toss in the flour mixture to coat. Add the milk and stir together until a stiff dough forms. Wrap the dough tightly in plastic wrap and chill for 1 hour. On a lightly floured surface, roll the dough into a long rectangle shape. Wrap tightly and chill for 1 more hour, then divide the dough in half and roll each portion out to a thickness of about 1/8-inch, in a long rectangle shape (approx. 10-inches wide by 22-inches long). Cut the dough into long, skinny triangles (about 5-inches at the wide end). Notch the wide end of each triangle with about a 1/2-inch cut, then roll from the wide end to the pointed end, tucking the point under the croissant. Place on a parchment-lined baking sheet, cover loosely with plastic wrap, and allow to proof for 2 hours. Preheat the oven to 375 degrees F, and gently brush the croissants with egg wash.
Bake for 15 to 20 minutes, or until puffed, golden brown, and flaky. Hey Barb! Honestly that is up to you. “Good” is kind of a relative term… But I’m guessing if you’re on a low-sodium diet then you’re probably used to foods being a little less salty? Maybe try cutting it in half or maybe just add a pinch? Croissant perfection! Those flaky layers look incredible! So why add the yeast if the dough is not made to rise and everything is kept cold? The dough IS meant to rise- it proofs for 2 hours after the croissants are shaped. Oh I have been looking for a croissant recipe! The video is very helpful. Thank you! I’m so excited to make these! I HAVE been intimated by other recipes- your’s is so simple, thank you!! Yay! Hope it works well for you. Have fun Alexandra! Is the milk warm or cold?